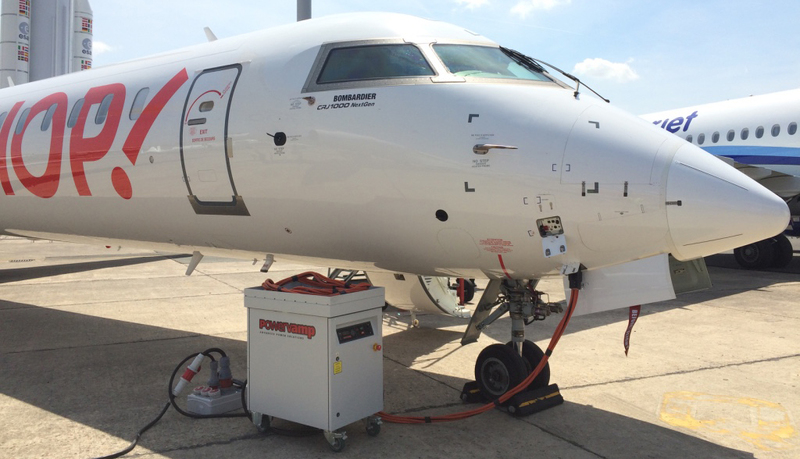 A more compact and agile ground power solution for companies maintaining and servicing larger regional passenger jet aircraft is now available in the form of the PV45 mobile electrical ground power unit (MEGPU) from UK company Powervamp Ltd, a world leader in aviation ground power and aircraft static inverters. The company says it has broad appeal for all specialist companies in the aircraft MRO (maintenance, repair and operations) sector. It is especially suitable for MROs replacing time-expired GPU equipment; for those setting up for the first time; and for those upgrading their existing operations to handle larger aircraft. Already a number of companies in this sector have taken advantage of the PV45, including Bristow Helicopters, Starlite Maintenance Johannesburg (Pty) Ltd, Inflite Engineering (Stansted), The Jet Centre (in the Isle Of Man) and ThyssenKrupp Marine. The PV45 is also being used by Powervamp’s own air show services division for providing ground power at the Paris and Farnborough air shows. Like any aircraft, medium-sized jet aircraft such as the Gulfstream G650 and Bombardier CRJ series need an external electrical power source to run their on-board electrics and avionics during servicing and repairs. Typically, MRO companies fulfil this need with a frequency converter connected to a three-phase mains supply within the hangar. However, these devices tend to be heavy and bulky, and are usually mounted in a fixed position in the hangar, sometimes requiring long trailing leads to connect them to the aircraft. Powervamp’s PV45 MEGPU offers a much more versatile solution. It is compact, relatively light (just 345kg), and self-contained. Whilst it can be equipped on request with an optional plinth for fixed mounting, as standard it is delivered as a mobile unit, complete with heavy-duty caster wheels (braked at the front). This means the PV45 can be moved easily around the hangar and positioned conveniently for each aircraft being serviced. So long as it is within reach of a 400-volt 50/60Hz three-phase mains supply, it can even be operated outside the hangar. Its IP (ingress protection) rating is IP55, meaning it is resistant to dust and rain, and the all-weather controls are built to the even tougher IP65 standard. The PV45 converts a 50/60Hz mains electrical supply to the 400Hz AC power required by the on-board electrical systems of medium-sized jet aircraft. It achieves this by combining a low-ripple 12-pulse input rectifier, an inverter (to convert the DC to 400Hz AC) and a high-grade output transformer. Its nominal power output rating is 45kVA. The 12-pulse rectifier is particularly effective in managing the input harmonics to prevent adverse effects on the mains electrical supply, meaning that the unit delivers notably “clean” power. The PV45 is packed with practical features. A backlit LCD screen with LED status indicators provides clear, easy-to-understand controls, and there is a tough tactile input keyboard. An integral real-time data logger is also provided. Other features include automatic line-drop compensation, and remote monitoring and control from a distance, either from the aircraft plug or via remote switches. There are numerous safety features, including an emergency stop button that shuts the system down in a controlled manner. There is an aircraft interlock to prevent output power being energised unless the unit is attached to an aircraft, and neutral monitoring ensures that the output power is disconnected in the event of a neutral cable failure. 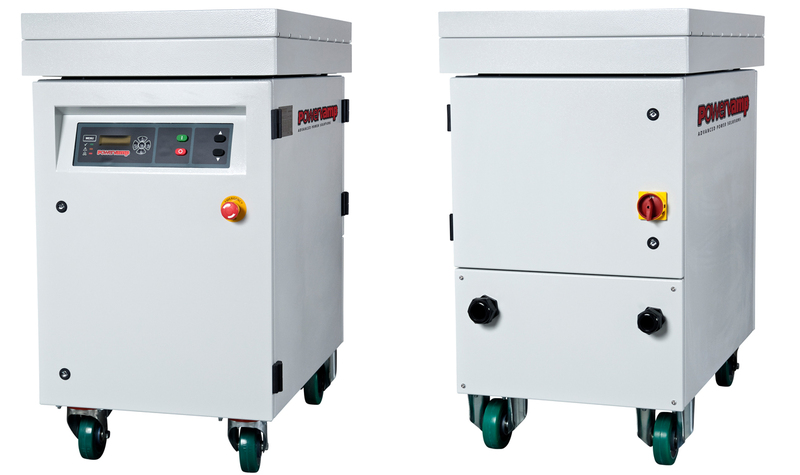 Powervamp’s PV45 is part of a family of mobile electrical ground power units, which also includes the third-generation PV90-3, which is suitable for running the on-board electrics of full-sized passenger aircraft such as the Airbus A380 and Boeing 747 and B777. Other existing users of the PV45 includes CHC Scotia, Arena Aviation and WAGA International. 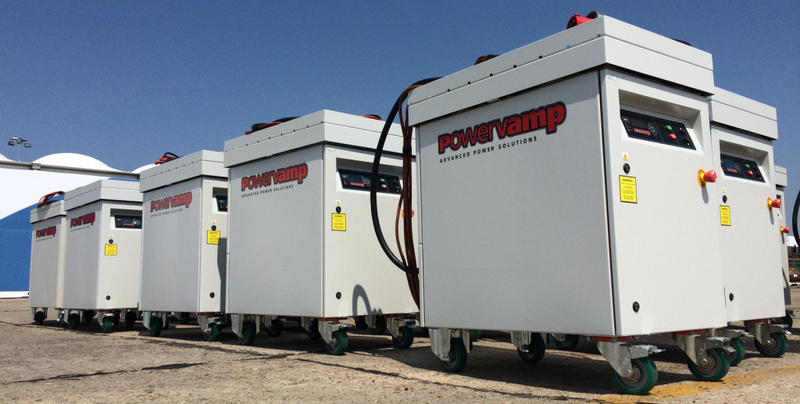 Widely-used Powervamp ground power products also include the company’s Coolspool DC battery-powered ramp carts, its portable DC aircraft start units, and its Coolspool Hybrid 300 mini-diesel ground power unit. For more information on the Powervamp PV45, (or the PV90-3), 400Hz frequency converter, please call our office on +44 (0) 1934 643000 or email info@powervamp.com.